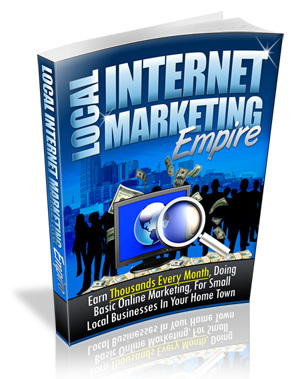 Claim Your Free Local Internet Marketing eBook! A few weeks ago I shared a Facebook ebook with you… I’m still amazed by the number of people who commented on the blog post and opted in to receive the ebook. Thanks for your support! But I don’t want to stop here… This time I want to share an ebook about local internet marketing with you! Local internet marketing truly is a great, untapped opportunity for you if you’re knowledgeable in internet marketing. You know how people say you can make a lot of money online because you can reach a worldwide audience. This is true! I have customers from all continents, but only have one website per product. The web has really changed the way we do business. However, some people took a different path… and got very successful too! How? Three words: local internet marketing. There are thousands and thousands of dollars to be made every single month by helping individuals and small businesses with their online marketing. If you know the small business world, you must have seen business owners talking about search engine optimization, pay per click advertising, social media marketing… without really knowing what this is all about! They need help… maybe your help! Some internet marketing firms charge outrageous amounts of money when you could come in at a lower price which would more affordable for small business owners. Each business could only require 1 day of work per month to manage their internet marketing campaign, so imagine if you had 15 of those… paying you every month! You can help them in a variety of fields… the fields you’re knowledgeable in! If you’re a home business owner or even a part-time worker, nothing stops you from becoming a local internet marketing consultant! If you want to learn more on this topic, I strongly suggest you to download this ebook on local internet marketing. It’s jam packed with how-to’s and tips on how to become successful and make money in this marketing field. And the best part is… you can do most of the work online! You don’t necessarily have to work on-site… Often, a few meetings will be enough to get things right. To download this Local Internet Marketing eBook, please enter your first name and best email address in the form below. This will direct you to our Bonuses page where you will be able to download the Facebook eBook as well as many other free products and bonuses. Thanks for sharing Colin! I agree with you, there’s a lot of money to be made in local online marketing… but it also depends on where you live! very interesting would think it would be a very important thing to know. I look forward to reading this ebook I have several friends that have small businesses that I have been trying to get to open websites, maybe a little more knowledge on my part could be just what I need to get them online. thanks for sharing this great idea about helping local businesses with their online marketing. I look forward to reading the ebook to learn more. You are very welcome Stacy, I hope it helps! There is gold to be made helping local businesses! Great blog posts. good information. I think, local internet marketing has recently came as huge bonus to all the internet marketing savvy due to not so huge competition over the globe. This post certainly helped a lot of SEO employees even some SEO clients if they have a look over it. Can’t wait to read your ebook. I know that there a lot of businesses that need these services. Huge opportunity to make money. Colin – I feel like you’ve been living in my brain. There are so many baaad local websites out there. Most people shop and buy services within a short distance of where they live or work. And, many, many services simply cannot happen over the Internet. Last time I checked my plumber, electrician, doctor, manicurist, pedicurist, esthetician, grocer, accountant were located nearby and could not perform their services otherwise. Well, the accountant may be the exception. I’ve been rattling my brains to help these businesses cost-effectively. I’m really looking forward to this e-book. I really want to translate my marketing know-how to help these guys. After all, I’m so passionate about small, locally-owned or operated businesses. Nice post Colin. Is your ebook still available? Thanks for this I was looking for more information about how to get started in local marketing. I’m an offliner AND a social monkee user as well…and I told numerous people about your service. You’re a mover and a shaker in the marketing world. Keep it up! On the surface sounds very interesting, now prove it. Hi there Colin – great article and something that im currently in the middle of launching ! So would be interested to see what the ebook has to say & many thanks in advance ! Ive also joined your list – so look forward to a longer relationship with a fellow internet marketer. Have an awesome day and enjoy ! Thanks so much for the info. I’m in the process of launching my local marketing business and your blog has been very helpful! This is an area of marketing that I am exploring. Your e-book will make a very good addition to my reference library. Thanks Colin for this great Post….I look forward to hearing more.